The medicines, tinctures or essences, if prepared by following the procedures of Separation, Purification and Recombination are called the Spagyric way of making a medicine. By the methods of Separation and Purification we get the three purified elements of the Plants (Herbs) and then recombine these, which is also called “Cohobation” (Reassembling of the three purified elements of the Plant by means of Spagyrism). c) Energy that can also be described as a chain of atoms bearing the properties of cations and anions, that is ions with positive or negative charges, that are able to take part in the biochemical process or reactions happening within the body’s cells. Thus, we can conclude ultimately that a Spagyric essence is rich in inorganic material, i.e. plant derived minerals salts which can be easily absorbed by the body of living organisms. Physiology revealed that mineral salts are important for all types of biochemistry or biochemical reactions that occur within the cells or tissues. Similarly, trace elements found in very small quantity in living organisms are very crucial for life, play an important role in metabolic reactions and act as catalysts. Now what is the “Vitiation of Blood and Lymph” and how does it occur? How are Spagyric Essences Suitable for De-vitiation? We know our body is a result or made up of 24 different elements, but just four of these make up the major part of our body weight. These four are: oxygen (O), hydrogen (H), nitrogen (N), and carbon (C). Hydrogen and oxygen combine to form water. The balance of chemicals in our body depends on our age. Chemicals are carried around the body dissolved in water. The most important of these is salt or sodium chloride (NaCl). The chemical make up of the body consists of three basic elements: major or macro elements, minor or micro elements and trace elements. The body needs specific amounts of chemicals so that essential chemical reactions can take place to keep the body in good working order. 1) Major elements are: oxygen, carbon, hydrogen and nitrogen. 2) Minor elements are: calcium (1.5%), phosphorus (1.0%), potassium (0.4%), sulfur (0.3%), sodium (6.2%), chlorine (0.2%) and magnesium (0.1%). 3) Trace elements are 0.1% of the body’s weight but are very crucial for life. The main trace elements are: chromium, cobalt, copper, fluoride, iodine, magnese, molbedinum, selenium, silicon, tin and vanedium. The need for water is one of the strongest human driving forces. Water is a transport system and a laboratory for vital chemical reactions. A drop in body water content of 5% causes strong thirst and a drop of around 20% results in death. The human body is composed of many different types of molecules. Molecules consist of one or more atoms of one or more elements joined by chemicals bonds. We know that the formation of specific proteins-enzymes may be hampered by the known availability of specific amino acids/elements in the body and this may cause the stopping or malfunctioning of a specific physiological activity which, if not overcome early, may lead to pathology of the cells and tissues. Blood and lymph are the only two channels to provide all kinds of transportation of the precursors of biomolecules required for biochemical reactions and, if hampered, may cause the stopping or malfunctioning of a specific physiological activity in specific cells and tissues. Thus we can say that if the precursors of biomolecules required for the proper metabolism of cells and tissues get deficient during transportation through the blood and lymph “Vitiation of Blood and Lymph” occurs. Therefore, only Spagyric medicines, which are rich in precursors of required biomeolecules, can overcome the problem of this deficiency of cells and tissue. So, when they are prescribed for the ody, they are able to de-vitiate the blood and lymph by supplying the required deficient precursors of the biomolecules to the body cells for their normal structure and function. Are Spagyric Essences Rich in Precursors of Biomolecules? Yes, biomolecules play an important role in living systems and are made up of carbon, oxygen, hydrogen, and nitrogen as major constituents. These major constituents are possible to get naturally only by means of Spagyrism. This process is widely used in the system of electrohomoepathy medicine that believes in the cure of diseases by de-vitiation of the blood and lymph. Dr. Ajit Singh practices electrohomeopathy and acupuncture as well as conducts research on medicinal plants in Punjab, India. Dr. Singh can be contacted at: drajit_7@hotmail.com. Website:www.sbeamattie.com. Writing poetry for more than ten years, I have explored poetic styles, starting with early lyrical and confessional works, and gradually drifting across the dream-sea towards less sentimental shores, to the sometimes chilly intellectual islands of language poetry (langpo) and other post-modern, non-traditional and non-narrative forms where the reader plays the significant role of extracting – or perhaps even allocating – meaning from a poem. The ‘true’ meaning of the poem is often hidden or encoded within multi-layered, largely unpunctuated, stream-of-consciousness-esque flow of allusive words and sentences and phrases and images … not always images, but with my own poems, I tend towards image-scapes. One might call them image-puzzles; telling some kind of exoteric ‘story’ on the surface, but obfuscating the true meaning. In this sense, my poems are acts of the occult, whereby I tantalize and stimulate language lovers (i.e. the mind) but shield or disguise the truth (i.e. the pearl, the heart) – a kind of poetic ‘Green Language’ tapping into various traditions and lineages in contemporary Australian and North American poetics. My exploration of the Language of Thoth, the Gay Speech, the Language of the Birds, the Language of God – call it what you will – intensified significantly during the time of the protracted deaths of both my mother and father. During this nineteen-month period I began to think about magic and alchemy, reconnecting with a life-long fascination that had slipped for some years. The spirit of poetry still burned within me, but it had been joined by something else. I became overtaken with the desire to realize the Stone – not simply to understand it conceptually or philosophically, but to facilitate its manifestation. As both my parents crept closer to their time to sleep with the earth, the Universal essence flung alchemy before me, every step of the way … so many markers along an apparent path, so long as I kept myself ‘open’ and didn’t try to force anything. There was a transmutation of this matter known as ‘me’ whereby a poetic-alchemical product was created … for the Hermetic Child of Sun and Moon to be born, both parents must die. This is a painful birth, to be certain. I honestly see myself as a living alchemical product, heading towards the Stone. The poems in liber xix: differentia liber record this transmutation process, this evening of myself to include more ‘heart’ to balance all of my out-of-control intellectualism. The nineteen x nineteen-line poems that comprise the suite also document the difference between modern man, the immature Adam (45) and God (26). It took nineteen months to write the nineteen-poem suite; nineteen months for both parents to die, and indeed, there are many other nuances of nineteen of significance, both inside and out, above and below. Writing each poem required me to establish contact with the source, the essence, which wasn’t always easy or pleasant. These poems changed me, and I know that neither my self nor my writing will be the same again. Coinciding with the agonizing demise of my mother and father, and with my desire for manifesting the Stone (spiritual and physical), I had a chance meeting with an alchemist/spagyricist who quickly became like a brother to me. I read more and more, discussing the Hermetic arts with my long-time partner and soror mystica, and my newfound brother. I was soon introduced to his alchemical mentor, and since that time, I have had the pleasure of knowing other aspirants to the Stone. All the while, my poetry and alchemy became united together, as one art for interpreting Nature. the maxim Solve et coagula, ‘Dissolve and combine’. Paul Hardacre was born in Brisbane, Australia in 1974. He is the Managing Editor of papertiger media, publishers of the papertiger: new world poetry CDROM, hutt poetry ezine, anything i like art ezine, and the soi 3 modern poets imprint. And he is a published poet. The nineteen nineteen-line poems of his latest work, liber xix: differentia liber, took one and a half years to complete and explore the mysteries, hermetic and alchemical cosmology, cabala and the ‘green language’, occult and devotional systems, the reconciliation of opposites, and death – both familial and mythological. With his long-time partner, artist and graphic designer Marissa Newell, he currently divides his time between Brisbane, Australia, and Chiang Mai, Thailand. Editor’s Note: The previous two issues of the Alchemy Journal featured the bibliographic research conducted by Johann Hasler with the publication of the first two parts of a series identifying the planetary attributions of plants. The first part included the table for the Sun. The second part included the publication of the next three tables for the Moon, Mercury and Venus. This issue includes the third and final part with the publication of the tables for Mars, Jupiter and Saturn. The Introduction to the Series, Notes to the Tables and the Bibliographic Key, published in the previous issues, are included again for easy reference. In this series of seven compiled tables of correspondences I do not wish to comment or establish a judgment over the validity of this and other problematic and strongly criticized epistemological approaches of the alchemy, magical herbalism, Hermeticism and other occult sciences. Yet as a complement to the existing qualitative data which such approaches yield, and which exist profusely, I present here some quantitative data, in this case of a bibliographical nature, so that a decision on the planetary correspondences of plants may be taken by the practitioner based on his or her preference of certain well-known authors in the field. For much of its history, alchemy has been a secret, a guarded and obscure way of interacting with the world. It is famous, as well as infamous, for its intentionally hidden writings, laboratory practices and the names of its most important practitioners. << To order this book online at a discount, click on bookcover. Alchemy at Work: Using the Ancient Arts to Enhance Your Work LIfe is a guide to using the ancient art of alchemy as a means of achieving career satisfaction and prosperity. The book is from a renowned British author and psychic, and therein is the chief clue to its contents. This book contains various forms of divination in general outlines (the author has also written The Complete Guide to Divination), several forms of psychic protection, as well as lists of crystals, basic universal meanings of symbols, gems, oils, incense and smudge sticks, as well as color meanings. All of this indicates that the real focus of this work is on using one’s innate, untapped abilities to expand your capabilities – which is a kind of alchemy all of us have access to. Go to Selections From This Book to see the Table of Contents and selected chapters. Robert Allen Bartlett – Practicing alchemist, author, chief chemist of Albertus’ Paracelsus Research Institute. New book is Real Alchemy. Paul Bartscher and Micah Nilsson – Practicing alchemists and plant spagyricists. Dr. Thom Cavalli – Jungian psychologist, writer, artist and teacher. Memmber of Alchemical Guild and the Hermetic Society. Author of Alchemical Psychology: Old Recipes for Living in the New World. Daniel Coaten – Practicing alchemist, medical herbalist, clinical aromatherapist, and lecturer who has a passion for herbal extraction research and botanical alchemy. Dr. Bruce Fisher – Hermeticist, spiritual alchemist, and author of over 20 books on alchemy. John Michael Greer – Hermetic scholar and author of over a dozen books on the Western esoteric tradition. Gudni Gudnason – Spiritual alchemist who studied with the Hermetic Order of the Golden Dawn in England and other mystery schools. Teaches at spiritual centers around the world, including Tibet, India, Japan, Europe, and the United States. Dr. Stanton Marlan – Author of The Black Sun: Alchemy and the Art of Darkness and other works on alchemy, as well as editor of Salt and the Alchemical Soul and Fire in the Stone. Jungian psychoanalyst and alchemy researcher. Jeff McBride – Practicing Hermeticist and world renowned performance Magician. Dr. Werner Nawrocki – Medical doctor and alchemist from Frankfurt, Germany. Initiated into alchemy by Frater Albertus in 1979. Author of Transformation: Secret of the World. Paul Rendak – Practicing alchemist and spagyricist. Former student of Frater Albertus. Duane Saari – Hermetic researcher and editor of the Alchemy Journal. Nicki Scully – Alchemical healer and explorer of Egytian and shamanic alchemy. Author of Alchemical Healing. Gary Stadler – Alchemical lab equipment developer. Artist. Tamara Stadler – Homeopathic alchemist and Hermetic musician. Mark Stavish – Practicing alchemist and author. Path of Alchemy: Energetic Healing and Natural Magic. Raoul Tollmann – Austrian alchemist and homeopathic spagyricist known for his rejuvenating gem elixir formulations. Timothy Wilkerson is a former student of Frater Albertus who attended Paracelsus College in Salt Lake City and graduated Prima in 1984. There are reasons. Originally, it was considered knowledge suitable only for an elite ruling or priest class. For a time, this powerful and “dangerous in the hands of the uninitiated” knowledge was shared with only initiates fully committed to its use for the greater good. Later, the Roman Catholic Church included it among the practices of the occult that lead unsuspecting souls to hell rather than heaven and persecuted its practitioners and teachers. Then, many alchemists were used by kings, rulers and the politically powerful for their personal ambitions. Eventually, this secret knowledge was driven almost completely into the dark, underground, unexplored side of developing societies and lost to most of us. However, over the last several hundred years, individual alchemists, working alone with the preserved information and practices have kept this inheritance alive in their writings and laboratories across the globe. Alchemy is an understanding of the Light and, therefore, cannot be completely hidden away. It seeps out of the dark in myriad ways through the work of individual alchemists such as Isaac Newton or in some of the miracles of modern medicine. Its message is also being tapped by poets, songwriters and performers. Examples of how alchemy permeates our culture are all around us. The Secret, a book and DVD published in 2006, is now a world wide phenomenon. According to its creators, the Emerald Tablet is the first statement of the Law of Attraction on which The Secret is based. Recently, I was approached by an individual who is planning a documentary on the relationship between The Secret and the Emerald Tablet. Last year, two conferences devoted to alchemy and its teachings were held. One, sponsored by the New York Open Center and co-sponsored by the Alchemy Museum in Kutna Hora and the Lumen Foundation, was held in Prague. It focused on the western esoteric tradition. The other was held in Philadelphia and sponsored by the Chemical Heritage Foundation. 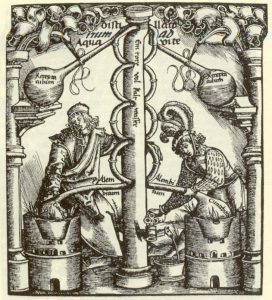 Many of the presenters at this conference spoke about the history of alchemy and its relationship to science. Another alchemy conference will be held in Las Vegas this year on October 6 and 7. This one is sponsored by the International Alchemy Guild. It is attracting a world wide, eclectic group of individuals using alchemy in many different ways. One of the articles in this issue of the Journal is by Dennis Hauck who is central to the conference’s conception and development. Dennis writes about the purpose of the gathering and his vision for its impact. We are surrounded by the influence of alchemy: its use in our public discourse, the expression of our deepest feelings in poetry such as that of Paul Hardacre’s in this issue, global conferences dedicated to it and the world wide response to the publication of The Secret. Lying at the core of the Great Work is the use of light, whether from the fire of calcination or our imagination. Alchemy cannot stay hidden. I believe it is time to bring alchemy out of the dark and reveal its treasures. Let me know if you agree or you don’t. Email me at: alchemyeditor@yahoo.com .